1 of 1! 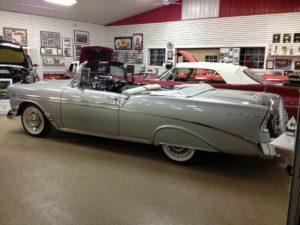 On display in the Ken Nagel collection is possibly the rarest 1956 Chevrolet Bel Air Convertible ever to roll of a GM assembly line. 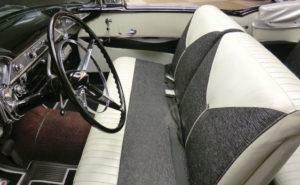 Restored in 1993 with original reconditioned or NOS parts, it retains its original drive train and interior. To the casual observer, this strikingly beautiful Bel Air Convertible seems to be just another remarkable restoration of one of the 41,268 treasured classics that Chevy made in ‘56. A second look at the 62 year old beauty, however, confirms that there is something unusual about this gleaming Bel Air Convertible that goes beyond the continental kit, sparkling chrome trim, wire wheel covers, exhaust extensions and all the other bells and whistles typical of a highly optioned piece of certifiable automobile art. Closer inspection reveals what may not be readily apparent at first glance. 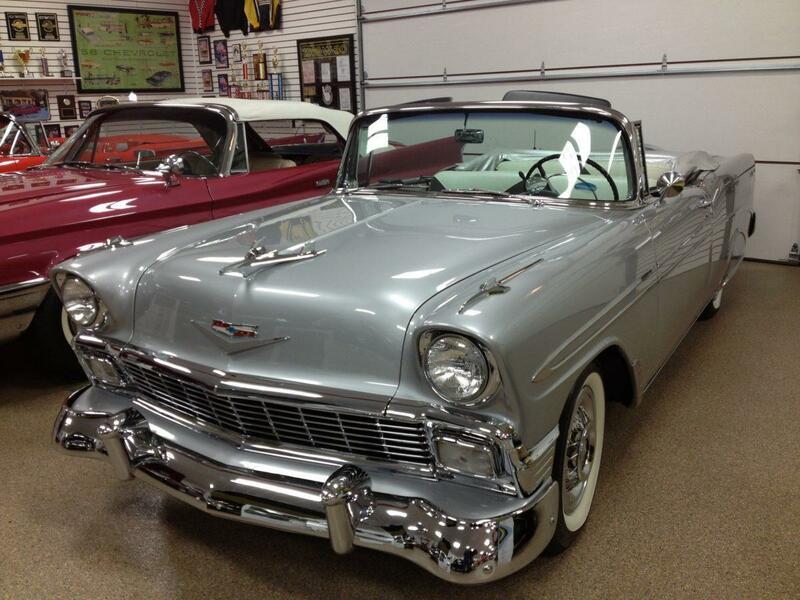 The paint scheme is Monotone instead of one of the Tu Tone color combinations typical of the ’56 Bel Air. 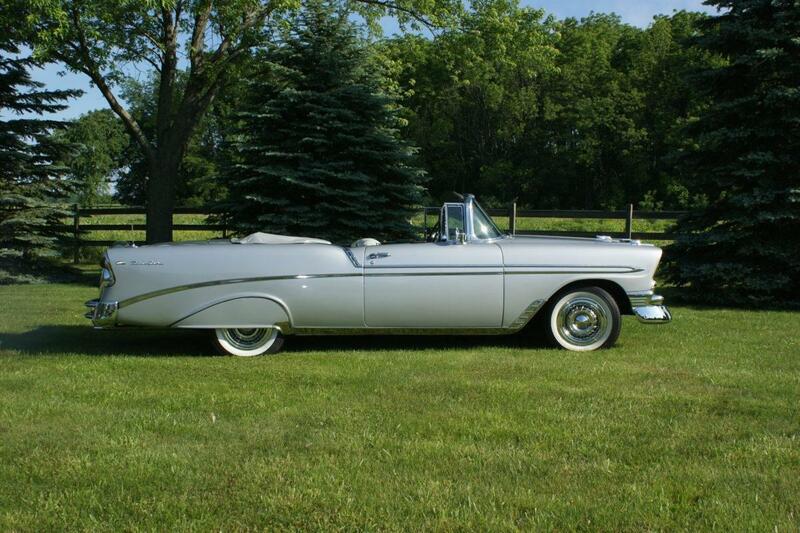 More significantly, of the 41,268 Bel Air V-8 Convertibles made in 1956 this is the only known factory, produced Bel Air Convertible to have rolled off the assembly line with Inca Silver paint and a solid monotone scheme. That’s right, one of one! 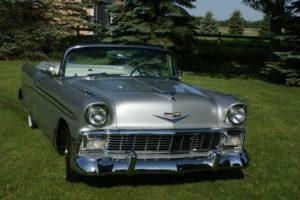 The 1956 Chevrolet color charts offered 10 different solid colors and 14 Tu Tone color combinations. Inca Silver was not among them! The 1956 Chevrolet Color Codes, GM Paint Cross-Reference and the 1956 Chevrolet Master Parts and Accessories Catalog Color charts, page 1127, show that the Inca Silver paint color was not made available to the Bel Air until spring, in advance of the 1957 model year, so it did not appear as an offering on the 1956 color charts in dealer showrooms. 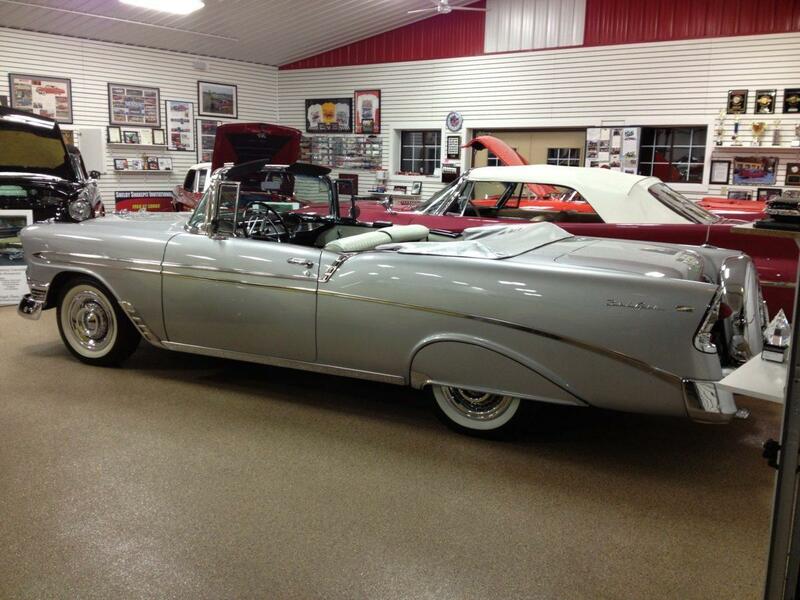 How did it happen to make it into the paint booth and on to this documented, matching numbers car? 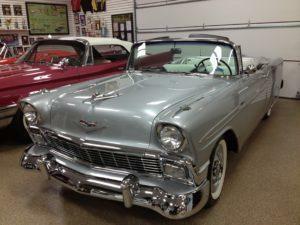 According to documentation and information provided by previous owners, this 1956 Chevrolet Bel Air Convertible has a story that begins in late 1956 at a medical convention in Tarrytown, New York. (There was a Chevy assembly plant in Tarrytown, NY that closed in 1996. It was originally opened by the Stanley Steam Car Company in 1896.) A husband and wife, in town for the convention, visited the local Chevrolet factory with the intention of ordering a new 1956 Chevrolet Bel Air convertible. In those days, you could actually show up at the factory and place your order. 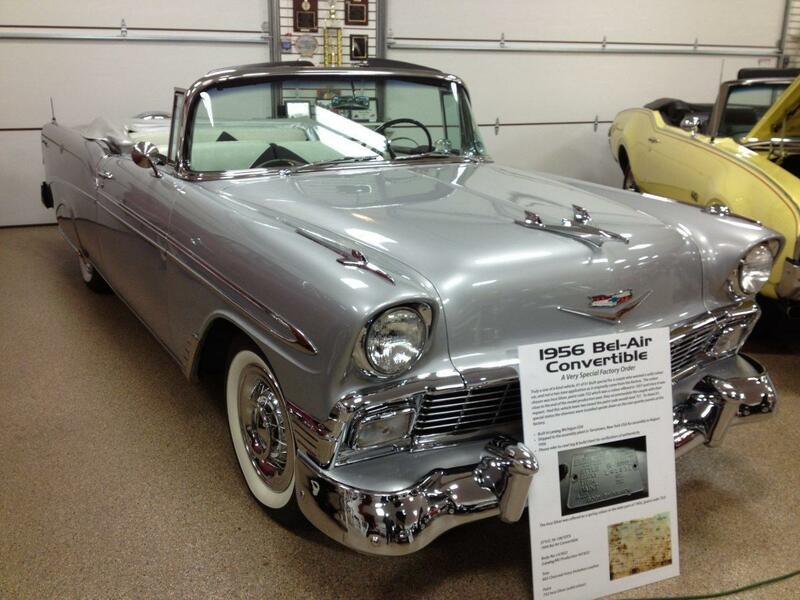 Somehow, they became aware of the of the Inca Silver color used on ’56 Corvettes. 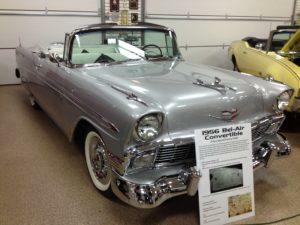 They were told that Inca Silver would not be available until the 1957 model year for the Bel Air. 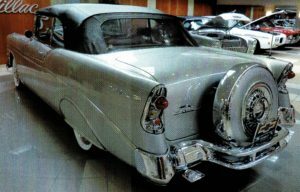 Never the less, they requested to have their 1956 car painted in solid Inca Silver without the contrasting India Ivory Tu Tone treatment. They thought that the solid color would not show everyday road dirt and grime as much. 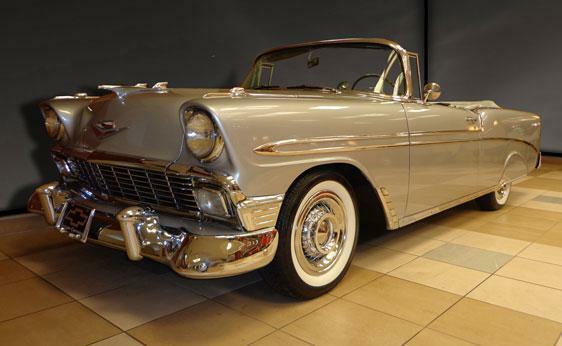 The problem was that the car was originally designed for a two-tone paint scheme and Inca Silver was a color destined for the 1957 model year, not 1956. As the story goes, since the 1956 model year production was near its end, the factory agreed to accommodate the unusual request. 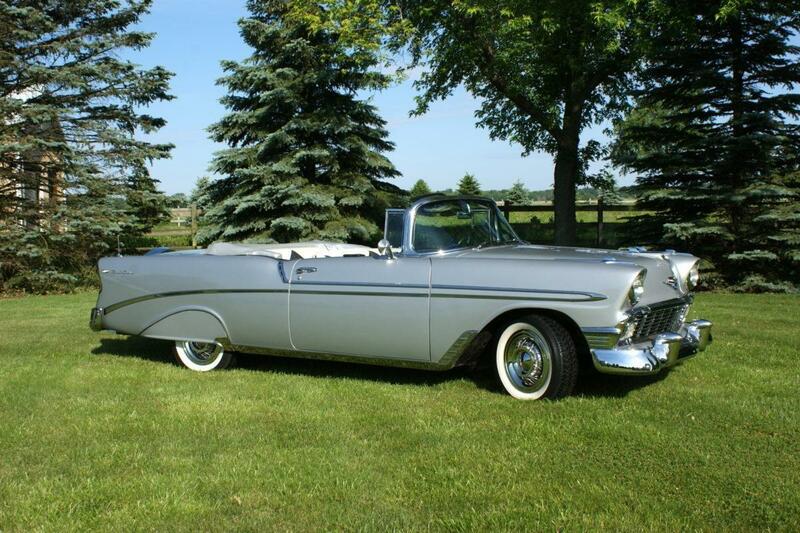 Thus, the car they ordered became the only 1956 Chevrolet Bel Air Convertible known to exist that came direct from the factory with paint code 752 (Inca Silver). And the only time Chevrolet used that paint on a Convertible Bel Air when it was not presented in a Tu Tone scheme. 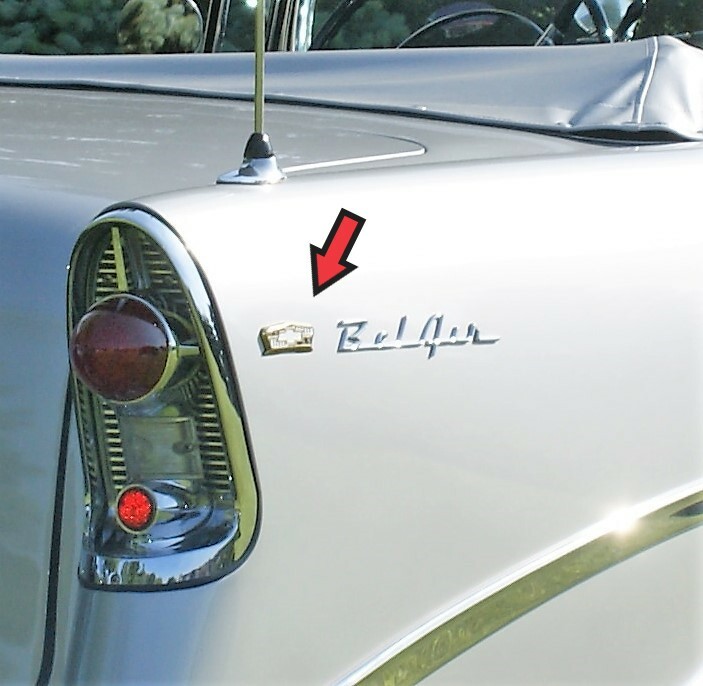 To demonstrate the unique status of this car, the factory installed the gold Chevrolet crest logos on the rear fender panels upside down. Many Chevy “experts” don’t believe it’s possible that it could be a true “from the factory” solid Inca Silver car. That is, until they see the cowl tag and original build sheet found under the rear seat when the frame-off restoration was done! 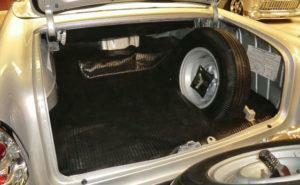 The car was shipped to a Lynsley Chevrolet in Montclair, New Jersey. 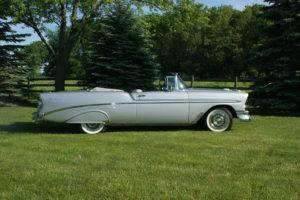 On September 13, 1956 it was delivered to the new owner Miriam MacMahon from Montclair, NJ. 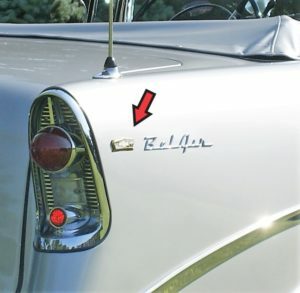 Miriam took great pride in calling her car “Miss Daisy”, as displayed by the whimsical cartoon graphic on the left side of the trunk. After enjoying the car for a number of years It was sold a friend, Donald D. Paradiso from West Orange, NJ. In 1993 the very rare car was treated to a meticulous frame-off restoration. 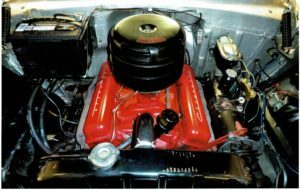 During the restoration, the original engine and transmission were rebuilt, the body and frame reconditioned, the original interior removed cleaned and reinstalled. According to the restorer, the 44,693 miles showing on the odometer is correct. 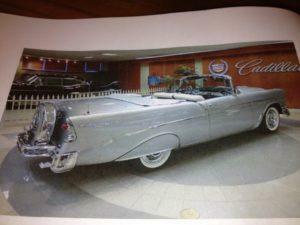 On March 15, 1994 it was sold to the Jim Gauthier of the Gauthier Auto Group Winnipeg Canada. 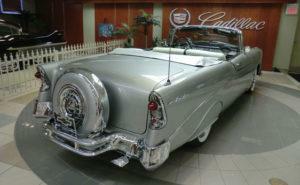 It was on display in his Chevrolet, Cadillac dealership showroom until it was acquired by Ken Nagel on March 22, 2013. 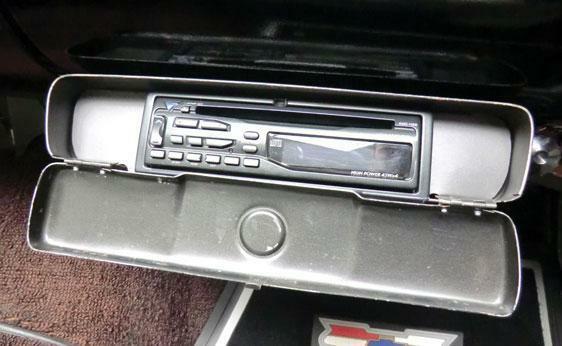 According to the original paperwork from the dealership, the car was ordered heavily optioned. The 265-cid, 170-hp 2 bbl carb V-8 engine is mated to the optional Powerglide transmission. 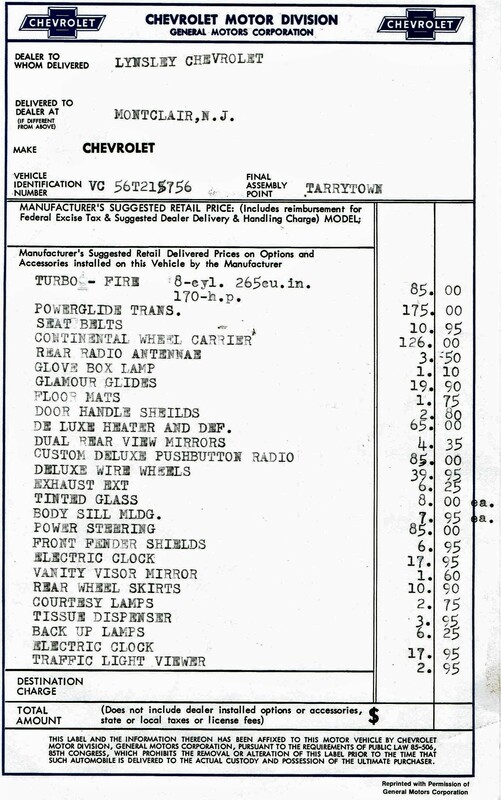 Original options consisted of: Continental kit, deluxe wire wheel covers, door handle shields, exhaust extensions, rear fender skirts, front fender shields, tinted glass, body sill molding, back up lights, vanity mirror, glove box light, electric clock, deluxe heater and defroster, power steering, power top, tissue dispenser (now converted to a Kenwood CD player), dual rearview mirrors, radio, rear antenna and seat belts. 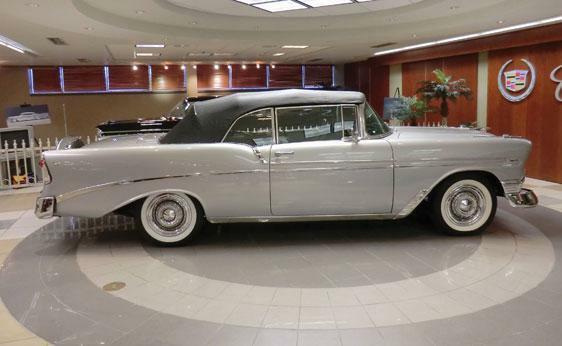 The Bel Air now rides on Coker Classic whitewall tires. Miriam also ordered the very rare Glamour Glides option at $19.90, consisting of a Nylon seat cushion cover/protector that also allowed occupants to “glide in and glide out – on nylon”. 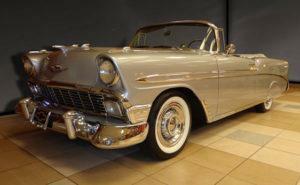 In 1956 Chevrolet sponsored the Dinah Shore Television show. The advertising program featured Dinah singing the famous jingle, “See the USA in your Chevrolet”. 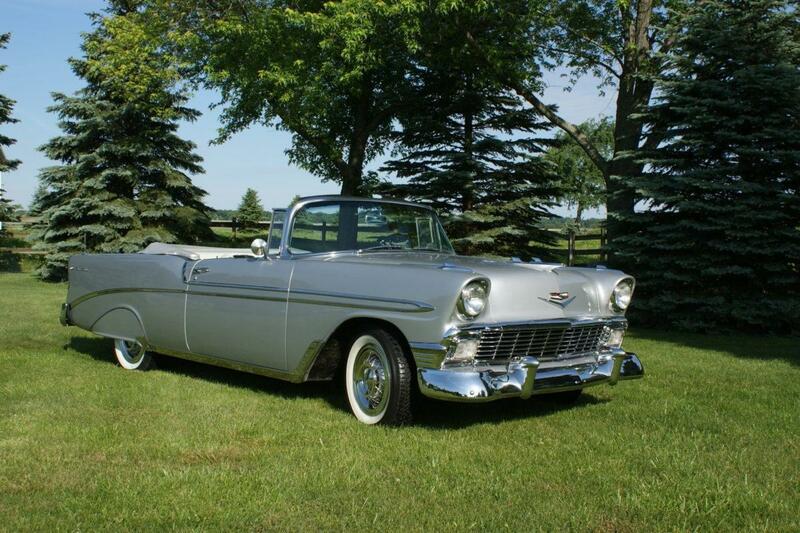 And, just like the advertising jingle suggested, many happy buyers took Chevrolet up on the offer by seeing the American countryside through the wraparound windshield of a two-tone (or in this case, a solid Inca Silver) ’56 Chevy Bel Air Convertible. 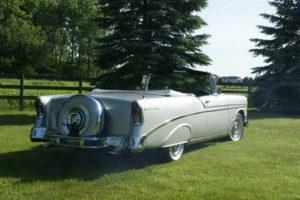 They became one of the most recognizable 1950’s American automobiles. 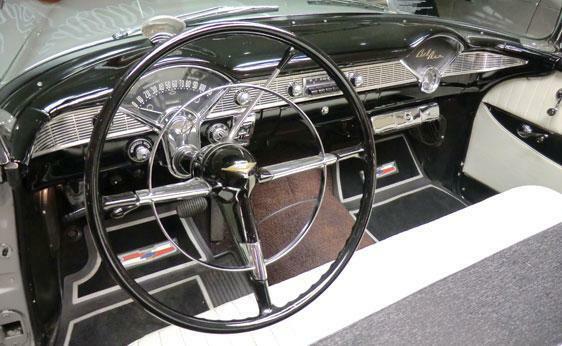 The second generation Bel Air received a minor facelift in 1956, a so-called 'Speedline' restyling that featured distinctive Tu Tone body-side treatments that imparted a look of motion even when standing still and elegant wheel openings in both the front and rear. Single housings incorporated the taillight, stoplight, and backup light. 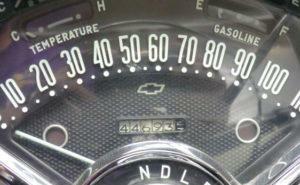 The left assembly held the gas filler, an idea popularized by Cadillac. 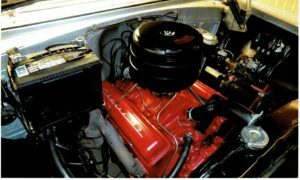 The 1956 Chevrolet Bel Air was the first of many Chevrolets to receive a face-lift that gave them a more conventional full-width grille, pleasing those customers who didn't favor the Ferrari-inspired '55 front end. Chevrolet produced 1,574,740 cars in the 1956 model year out selling rival Ford by 150,000 units. 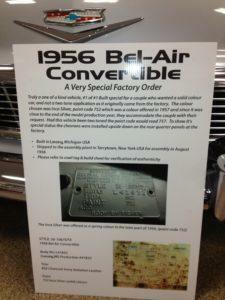 41,268 were Bel Air Convertibles. 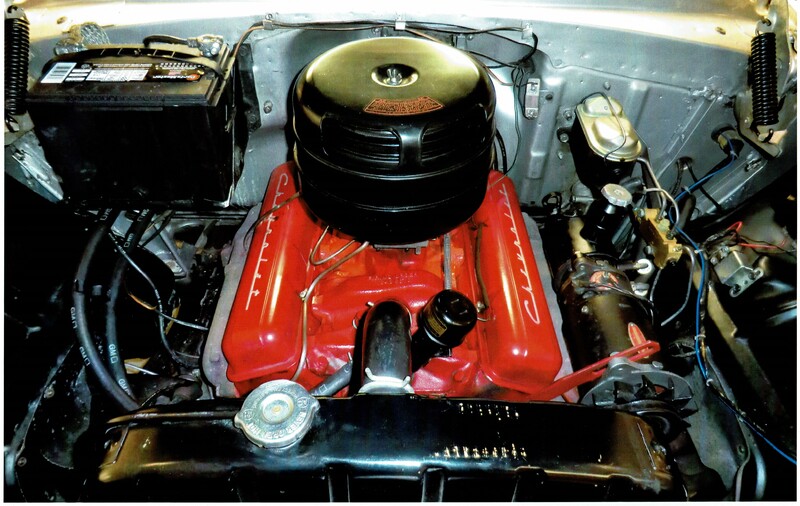 The 3,320 pound car cost $2,443 with the base V-8. 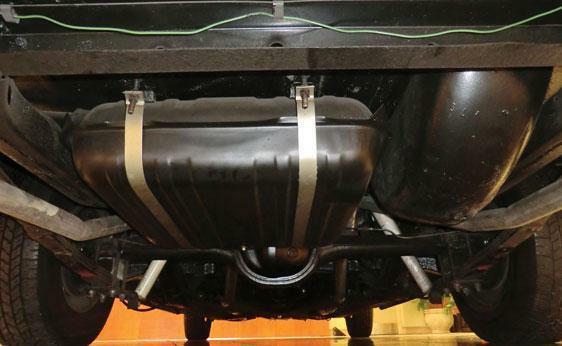 You could literally load your new Chevy with factory options and accessories and stay under $3,000. 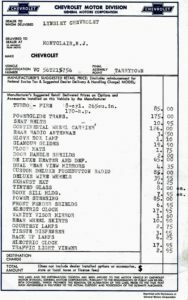 In 1956, General Motors offered over 50 accessories on their 1956 Chevrolets, some are listed here. “Miss Daisy” has 26 of them. Remote control door mirror $6.95. Radio choices -$63.50 for the basic manual to $105.00 for the pushbutton signal seeking unit. 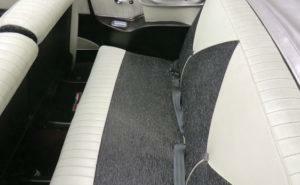 Power windows and power front seats $155.00.